Ever since the 5300-year-old mummy was discovered by hikers in the Ötztal Alps in 1991, scientists have been taken with Ötzi the Iceman. From his dozens of tattoos to his ulcer-causing gut bacteria, Ötzi's remarkably well-preserved body offers clues to what life may have been like in Copper Age Europe. The delicate specimen is currently kept in a below-freezing, climate-controlled vault in the South Tyrol Museum of Archaeology that's off limits to the public. 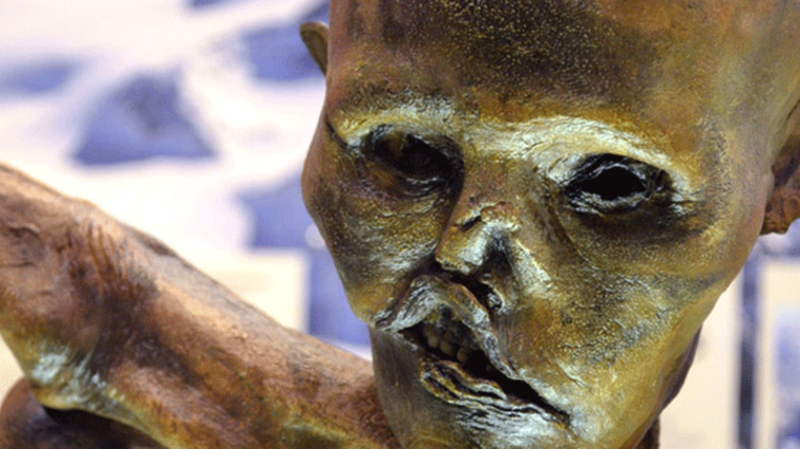 Now, 3D-printing has made Ötzi available to a wider audience. According to Smithsonian, the DNA Learning Center at Cold Spring Harbor Laboratory commissioned paleoartist Gary Staab and the 3D-printing firm Materialise to create three highly detailed replicas of the famous mummy. The team has experience working together to create 3D-models of long-gone figures from history. In 2010, Staab and Materialise collaborated to produce a 3D-printed replica of the pharaoh Tutankhamen. To make the lifesize model, CAT scans were taken of Ötzi to create a single file of the body. Some body parts, like a few ribs, were missing, and engineers had to use 3D-modeling techniques to recreate them. After the 5-foot, 5-inch tall replica was printed out of liquid resin, Staab and his team spent approximately 2000 hours post-processing the model with artistic details until their copy was practically identical to the original. The entire process is detailed in the NOVA special "Iceman Reborn," which recently premiered on PBS (you can watch the trailer below). Ötzi's 3D-printed twin is currently on display at the DNA Learning Center in Cold Spring Harbor, New York.